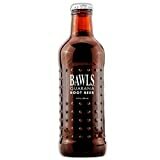 Bawls Root Beer (formerly called Geek Beer) is root beer flavored guarana soda popular with gamers. Most of us are familiar with the Bawls brand - carrying with it the onslaught of abhorrent jokes and the memories of the dark caverns of intense LAN parties and cram sessions that the drink typically lurks within. Its familiar blue-spotted bottle has hailed for some time as a tweaked soft drink of choice for avid gamers, students, and generally those who want a small buzz. To mix things up a bit and perhaps as a tribute to its followers, Bawls has offered us a new concoction of its guarana drink: G33K B33R. The name sports an obvious reference to the drink's heritage. The root beer elixir is contained within a dark brown bottle with the famous spotted texture. Nevertheless, can Bawls create another guarana hit among its fans and non-fans alike? G33K B33R goes down smooth, but not too smooth due to its carbonated bite. The bite and flavor reminds me a lot of Barqs Root Beer, Coca Cola's most prominent root beer soda. It has a sweet, rich flavor (body, if you will) that satisfies my taste buds and the root beer experience very well. However, it is tough to notice the guarana influence, unlike its blue-bottled counterpart. I did notice a subtle bitter aftertaste that could be sourced to its caffeine and citric acid content. G33K B33R contains the typical Bawls formula of Guarana Extract and Caffeine as its energizing elements, along with the usual soda ingredients. One thing to note is that it uses High Fructose Corn Syrup as a sweetener, which has been controversial. Bawls only offers a slight energy boost to a seasoned caffeine consumer such as myself. I felt an initial pickup in my alertness, typing speed, and began to think a bit faster, but that's about it. It didn't last long. If you are used to a higher ratio of caffeine per liter, then this won't give you anything close to a monstrous buzz. However, if it's mid-afternoon and you feel a little tired at work or school, then this is the drink to get you out of the slump. Bawls has not published the exact amount within G33K B33R, claiming "enough guarana caffeine to make it as strong as a cup of coffee". I would say it is close if not exactly the same as the original Bawls' 66.7 mg caffeine content. Bawls' G33K B33R definitely fulfills its purpose as a great-tasting root beer pick-me-up and is a valuable addition to the Bawls family of guarana drinks. However, it leaves me longing for a better buzz. Perhaps we will see G33K B33R Exxtra in the future! Sugar content: 72 grams (per 16 ounces). How Does Bawls Root Beer Compare? Bawls Root Beer contains 6.25 mgs of caffeine per fluid ounce (21.13mg/100 ml).